Joining the search for the ultimate hybrid technology is BMW, with the release of their concept Hybrid X3, based on the line of SUV that BMW released in 2004. While the concept probably won’t be put into production in its current form, the X3 provides a useful testing platform for BMWs new technologies. Bear in mind during the rest of this article that with the introduction of these new technologies, performance improved immensely as fuel economy did. The top speed of the X3 Hybrid is around 146 mph, and the 0-60mph is 6.7 seconds, a full three seconds faster than the non-hybrid version. And with these performance increases, the X3 hybrid uses 20% less fuel. 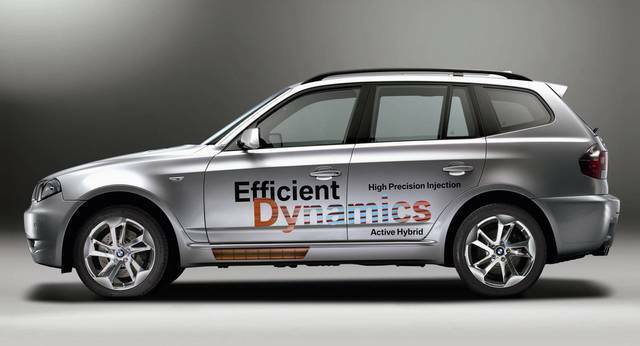 The first technology BMW brought into the X3 Hybrid is the High Precision Injection System. Without getting too technical, this changes the location and make-up of the fuel injectors, allowing it to make a more efficient mix of fuel and air, without as much waste. The jet-injectors have more precision and control of the fuel than other injectors. BMW claims that this HPI system uses at least 10% less fuel than other fuel injectors, while increasing the performance of that fuel. The second new technology BMW introduces in the X3 Hybrid is the Supercap, a high-performance capacitor. The Supercaps provide acceleration in conjunction with the engine, which is where the 3 seconds comes from in the 0-60 tests. Because the Supercaps are only used for about 3 seconds at a time for acceleration, they are recharged after each use, so you always get the maximum output out of them. The Active Transmission combines the power of the Supercaps, an 80hp electric motor, and a traditional engine for maximum performance and fuel efficiency. And better still, all of the support systems, like air conditioning, are run electrically, so they don’t have any kind of drain on the engine, allowing for more power toward acceleration. If production of these combinations ever becomes standard, BMW could corner a market on high-performance hybrids. Estimates say that the X3 Hybrid would get about 25 miles per gallon, excellent fuel efficiency for an SUV. I can’t wait to see how BMW actually utilizes any or all of these technologies. This entry was posted in Exotic Cars, Foreign Cars, Hybrid Cars, Trucks & SUVs, United States. Bookmark the permalink.